Minor SPOILERS for Guardians of the Galaxy Vol. 2 follow. 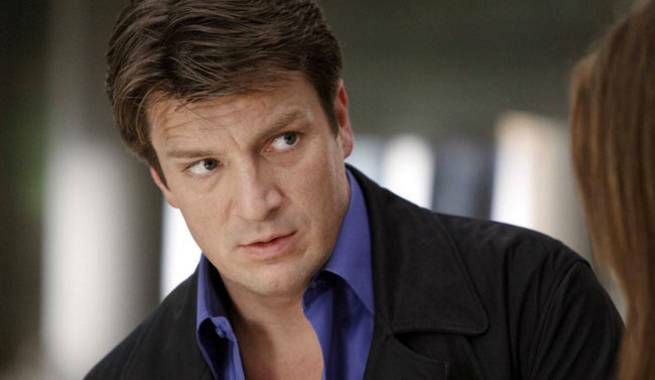 Fan favorite Firefly star Nathan Fillion is Simon Williams, a.k.a. Wonder Man, in Guardians of the Galaxy Vol. 2. In the Marvel Comics Universe, Simon Williams is a former members of the Masters of Evil, and brother of villain the Grim Reaper, who reformed and joined the Avengers. Williams eventually retired from the Avengers to pursue an acting career. He was later dragged back into the Avengers’ active roster, despite becoming a pacifist, as a member of the Avengers Unity Division. He paid the ultimate price while defending the Earth from the Apocalypse Twins. Photos surfaced online (via Jonathan Hunter) recently that show Fillion’s face on several mock movie posters surrounding a theater in Cartersville, Ga. The theater’s marquee reveals the theater is hosting a Simon Williams movie festival. The posters range in tone from romantic comedy Oh, Rebecca, to a Conan-esque poster for a movie about Conan-esque Marvel Comics character Arkon, and a Steve Jobs style poster for a biopic about Tony Stark, all starring Williams. The shoot seems to confirm that a portion of Guardians of the Galaxy Vol. 2 will take place on Earth, but whether it will be flashback or present day isn't clear. Some of the posters seem purposely dated in style, but it being a film festival means they could be showing older movies in the present day. It seems likely that these posters are just meant to be Easter eggs, so don't expect to see Fillion fighting bad guys as Wonder Man in the movie. Check out when Guardians of the Galaxy Vol. 2 and other movies are coming out in ComicBook.com's Movie Release Schedule.